The Reactor 2 E-XP2 by Graco is designed to give you smooth and consistent applications for polyurea, while providing cutting edge technology to record results and store information. The new design provides for easy maintenance access as well as taking up less space in your rig or warehouse- leaving you even more room for additional spray foam equipment. The electrical and circuitry designs prevent against power surge destruction, as well as provide constant operation during fluctuations of power supply. 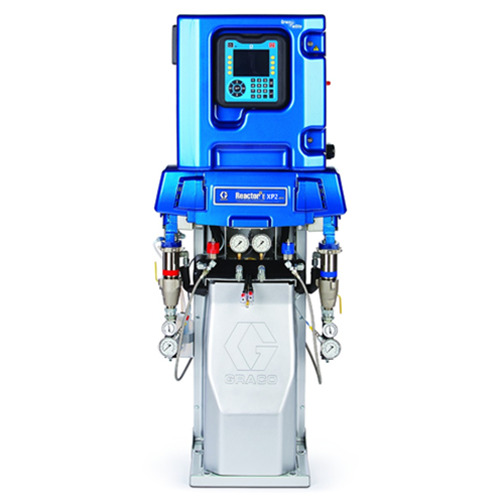 Featuring Graco InSite technology, the Elite model of the Reactor 2 E-XP2 machine for Polyurea has the ability to store up to 24 recipes and can allow you to monitor, track and save all of your relevant jobsite and project information. Planning can be improved with accurate estimates, and you can track productivity regardless if you are on the jobsite with your crews or working in the office. InSite can be accessed remotely, and allows you to see what, when and where your Reactor 2 is being used. Confirm that a job is being sprayed to specifications, and take advantage of easy troubleshooting using QR Codes. The Reactor 2 E-XP2 Elite is available as a Polyurea standalone unit, or can be purchased as part of a system. Choose from the Fusion AP Gun package, or the Probler P2 Gun Package. Each Reactor 2 E-XP2 Elite comes standard with Graco InSite, a 15 KW heater, inlet temperature and pressure sensors and Xtreme wrap scuff guard for your hoses. The Gun packages are accompanied with a whip hose (10 Feet) and a heated hose (50 feet) as well the AR4242 mixing chamber for the Fusion AP package. Choose Graco spray foam equipment at Intech and receive the best in the industry’s products and expert service every step of the way. As a Graco Top 20 distributor for three years running, we have the knowledge and relationships to foster your purchase from start to finish, as well as assist in product troubleshooting and modifications. Contact us today or place your order online!